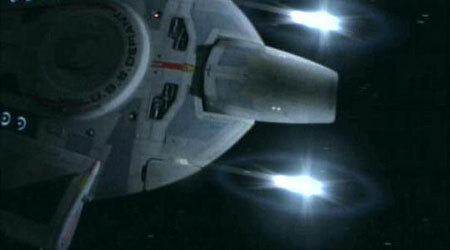 The quantum torpedo is Starfleet s replacement for the standard photon torpedo aboard starships. The quantum torpedo operates through super string theory, specifically zero point energy, where an eleven dimensional membrane is created and twisted into a form of a Genus 1 then pinched off from the background vacuum energy. This act calls into existence a large number of new sub-atomic particles and freeing energy used to power the warhead. This process is similar to the event that created the universe in the big bang. Testing of the quantum torpedo first took place on 2355 under the surface of an abandon moon. The energ y output of the device was calculated to be 52.3 isotons, more than twice the theoretical maximum output of a standard photon torpedo. The design of the quantum torpedo consists of the zero-point field reaction chamber with an EM initiator attached to one end of the chamber along with an EM recti fier, waveguide bundle, subspace field generator, and continuum distortion emitter. The zero point reaction is powered by an uprated photon torpedo warhead with a yield of 21.8 isotons. The energy of the antimatter detonation is funneled into the initiator where the membrane reaction occurs. The quantum torpedo is currently only being used aboard Defiant and Sovereign class vessels due to the difficult in manufacturing each torpedo.